I’ll be the first to admit that I struggle with enjoying novellas. Most of the time, I am left unfulfilled with the conclusion at the end, because it seems as though the author just ran out of word count and had to end the story at a given point. Even more so, I’m not a fan of books where it encompasses only a couple of scenes, because I feel even more jilted. 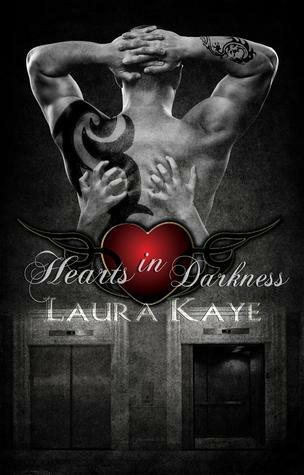 So when I saw that Hearts in Darkness was only 110 pages in print, I was skeptical. About the only thing that convinced me to pick it up was that many of my friends had given it 4 and 5 stars on Goodreads.com and since I rely on them to help me choose the books, I want to read – I took a chance on it. I have to admit that overall, I was pleasantly surprised. True it was short and it only took me about 40 minutes to read (if that), but I felt like the author did a good job in the limited time she had for character development and while maybe a tad unbelieveable…umm, yeah, hooking up with a guy who you got stuck in an elevator is every girl’s wish right? I liked how the story progressed. I would love to see her take the characters and re-visit them, or maybe feature some of the minor ones that appears in this book and give them their own. FWIW, I also loved the cover – how it was attractive without being too showy – there was just something that drew me to it. I’m curious to know who the cover artist was, so i can see what else they have designed in the future. Either way, I am intrigued enough by her writing, that I am going to be checking out some other books by her in the future and hopefully, they are as enjoyable as this one. 3.75 stars. This is one of the few novellas that I loved. She was able to draw a real connection with the characters in such a short period of time. I read and reviewed this one awhile back and liked it. I think I liked the tat & pierced hero also, but then he was also flawed. Not my usual cuppa but throughly enjoyable..